It was in the afternoon of Christmas 2011 when my son was struck by a mild case of fever and a few instances of vomiting. 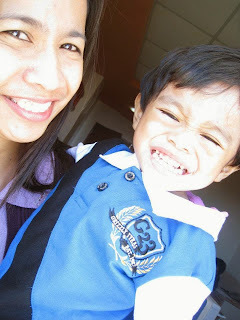 We had to rush him to a hospital in Tagaytay City even on that very day when most kids were supposed to be celebrating the occasion. And it was in one of those days when I was just there sitting in the hospital room that I began to think of how 2011 went for me and my family. I have to admit that my current situation is not conducive to a positive reflection on the year that has passed. Being in a hospital room with my son still ill is not an ideal setting to start an assessment of how things turned out. It could have made me focus on the negative things that happened more than I needed to. Even so, I began my analysis of my own feelings about all that I can remember from the year that has just ended. As I look at the family that I feel fortunate to have, I believe that I am extremely blessed even with all the problems that we have had to face in more than one occasion. We started the year living apart from each other due to our different work locations. My kids were with their mother while I was living in an apartment more than a hundred kilometers away due to my work. Luckily, we were able to muster the courage to decide to live together by the middle of the year. My fiancée and I agreed that she would have to stop working to manage the household and look after the kids while I try to earn a living. Admittedly, we did not see ourselves as 100 percent prepared to jump ahead with our plans but we still moved forward. And now that six months have passed since that decision was made, we both feel that we could not have made a more prudent decision. My son, even as he is still in the middle of recuperating, has been an active kid driving us crazy sometimes in a very enjoyable way. He has been a constant source of joy for all of us. He is inquisitive and demands our full attention when he wants something done. While my daughter cannot stop asking questions about all kinds of things which could work my mind to alertness it has never been accustomed with. She brings abundant happiness to our family with everything she does. Last but certainly not the least, my fiancée have proven how difficult a person she can be but her strong personality only brought positive things I could not imagine being able to accomplish by myself. A review of the year 2011 brings to my mind the most important persons in my life and the lessons each of them has taught me without realizing it. I am reminded always of the fleeting nature of our existence which makes time invaluable than any other resources at my disposal. I have come to realize the importance of the moment and to a lesser degree the future that concerns us always. I have made progress in consciously giving less weight to material objects as a source of happiness. I believe that things can serve some limited purpose but could easily cloud our thinking to giving it more value than they deserve. Having said all that, I would not diminish the problems that we encountered and the unfortunate events that befell others we care about. I have viewed them more positively as sources of opportunities to make something better rather than an undesirable inconvenience that should be avoided. My only hope, moving to the new year 2012, is that the right lessons would stick to make the new year even better than the old one.